His supervisor, CSR co-owner Scott Anderson, chimed in about his biggest need: “I can’t find workers. If someone could just show up here and fog up a mirror, they would be hired. Malcolm’s great, but there aren’t enough Malcolms,” Anderson said. In Anderson’s view, both the quality and the quantity of workers are lacking. While he strongly supports training younger workers, he has grown increasingly frustrated at how hard it is to find and maintain a staff. “I love career and technical education like Core Plus, but it’s a complex topic with many problems that need addressing for our industry to find the next generation of employees. Get this – can you believe that the state doesn’t even fund the development of maritime curriculum to teach the trades?” said Anderson. The U.S. has reached a 50-year low in raw unemployment numbers with a jobless rate of 3.7 percent in September (though the economy added a less-than-expected 134,000 jobs, according to the Bureau of Labor Statistics). Washington has a 4.6 percent unemployment rate. Additionally, the number of people going into hands-on technical positions has declined. According to a national study from the Association of General Contractors, there will be a shortage of 31 million tradespeople by 2020. “The ‘college-for-all’ mantra gets beat into kids’ and parents’ heads. The simple fact is that college may not be for everybody,” said Rep. Gael Tarleton, a Democrat representing Ballard and surrounding areas. Tarleton led the effort to make career and technical education a component of basic state curriculum. “Folding CTE into basic education means that the state is obligated to fully fund these two per the state of Washington’s Constitution,” said Tarleton. Dunston exemplifies how college may not be the best step for kids right out of high school. 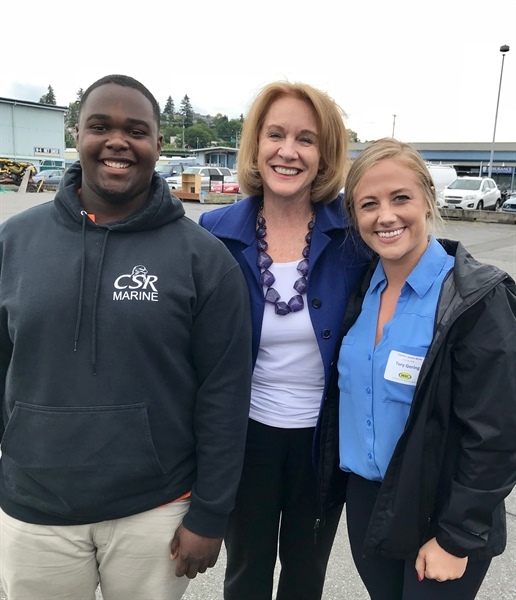 Tory Gering of Core Plus, one of the premier CTE programs for the state, mentored Dunston to prepare him for his CSR career. “Malcolm wasn’t super interested in college. Core Plus helped him graduate by providing math and science credit at Rainier Beach High School. He was 17 at the time when he graduated from Rainer. He started fulltime on his 18th birthday, busing two hours each way from Rainier Beach to Ballard, and he’s never looked back,” said Gering. With baby boomers retiring in ever-growing numbers, the labor shortage is becoming more acute. Boomers began leaving the workforce in 2011 and are now about 10,000 retire each day. They are taking vast institutional knowledge with them. An infographic released by staffing company Adecco shows that 53 percent of skilled trade workers are at least 45 years old; 19 percent are over 55. Workers are aging, and not enough young people have an interest in stepping into those roles. If they do, the often lack needed skills. Ann Avary, a maritime leader who specializes in training the next generation of workers, runs the Northwest Center of Excellence for Marine Manufacturing & Technology. She hears about the demand every day. “A day doesn’t go by that I don’t get three calls from employers looking for employees,” she said. The Center of Excellence serves as statewide liaisons between business, industry, labor and education to create a highly skilled and available workforce. While it’s filling a need, it can’t keep up with demand, according to Avary. “Automation and technological improvements will have a transformational impact on skills, education and training,” she said. “Right now, the industry needs technical talent in nearly every area: shore side, underway, seafood processing, logistics, aluminum welding, electrical, systems, engineering, operations, mechanical, crane operators, electronics, refrigeration systems, the list goes on. “As educators, we have to be willing and able to step up to the challenge of supporting a workforce for the industry – that means taking a more entrepreneurial approach to how we educate, train and provide professional development. In particular, we need to support a registered apprenticeship and pre-apprenticeship model that works for small and medium-sized employers. We're doing a lot of work with under-represented women, tribal and Latino/Latina communities right now, with more work coming in other communities,” Avary said. These issues are not limited to the Northwest. Bill Yeargin of Correct Craft prescribed some solutions to address the shortage of workers nationally in a wildly circulated column he wrote. As Yeargin sees it, first, the economy and businesses need people who will show up and work hard even if they do not have the training. Second, the industry could use people who have technical skills. Yeargin also offers some solutions. The plan has five parts including: promoting the industry as a great place to work – similar to how boating is promoted as a great way to invest time with friends and family; establishing relationships with trade schools across the country to ensure the students at those schools know about the boating industry and the opportunities it offers; and using existing boat shows to promote careers in boating. Boat shows can introduce boating careers to those who attend. He also suggests considering the acquisition of a trade school to be owned by the National Marine Manufacturers Association. Each of Yeargin’s points echoes work being done in Washington. When it comes to promoting the industry as a great place to work, the Washington Maritime Federation, the state association that represents the maritime industry, is putting together a plan to recruit more young people in the trades. Plus, new leadership at established programs at the Seattle Maritime Academy and the Northwest School of Wooden Boatbuilding is promoting career options for those seeking land and sea employment opportunities. Avary recognizes how the word needs to get out about pay, especially consider how much debt students typically carry. According to a Seattle Times story from 2017, the state university with the highest average debt per student is Washington State, at $25,874. About 58 percent of WSU grads had student debt. University of Washington Seattle students carried an average debt load of $21,900. “From Colville to the Puget Sound Naval Shipyard, companies are starting to seek partnerships with their local high schools. And thanks to programs like Core Plus, they get connected with dynamic teachers and get results in a short amount of time,” said Gering. “There’s somewhere around 400 shop classes in Washington high schools, although no one would guess it. It’s difficult to compete with the college-for-all movement, but it’s starting to happen with good success. I think some of these startup, short-term, feel-good, government initiatives could learn a lot from what’s already being done within the K-12 schools,” said Gering. Northwest Marine Trade Association’s sponsors a career fair each year at the Seattle Boat Show. Twenty-three exhibitors attended last year to fill 350 positions. Attendees from the career fair received complimentary admission to the show. About 125 job-hunters attended last year, and several were hired on site. The acquisition of a trade school also is a topic that leaders, including a newly elected port commissioner, are prioritizing. The desire would be to build on the success of the aerospace high school in Renton. Avary, of the Center of Excellence for Marine Manufacturing, provides a global perspective to addressing the skills gap. And while technology may make jobs more efficient, the need for Dunston and his peers to grab hold of these positions in the meantime will not go away. “My biggest accomplishment is learning how to lay fiberglass and to learn new things every day,” Dunston said. “Every day is different, and every day I learn something new. And I have big plans. Next on my list is to get certified in underwater welding. I didn’t even know that was a thing just a few years ago. “I’m in this for the long haul,” he said as he dashed back to the yard. Core Plus: Boeing provided the seed money to jump-start this two-year program. Now, Core Plus is tackling maritime. When completed, which will occur in the next few months, over 1,000 hours of curriculum will be ready for teachers to adopt in their classrooms. Maritime Discovery Schools initiative: The Port Townsend school system adopted this place-based approach to their school system’s curriculum to make school more real for this maritime community. Math students learn geometry through sail-making. Kindegarten PE means kids are learning to swim, and salmon habitat fills the science classes. Northwest Center of Excellence for Marine Manufacturing & Technology: Located in Anacortes, this school places 100% of their students into boatyards in the area upon completion. The partnerships do not stop at the water’s edge in Skagit County. Related programs for marine manufacturing can be found throughout the Northwest with a number of Washington State Community & Technical Colleges and Private Providers from Bellingham to Vancouver, Washington. Seattle Maritime Academy: If being underway is more your speed, check out this new campus located in Ballard. This school prepares men and women for careers in passenger transportation, fishing and seafood processing, international trade, military operations and other maritime sub-sectors. The Wood Technology Center at Seattle Central College: This school, which is part of the Seattle Central College system, provides a comprehensive hands-on training in boat-building, repair/retrofitting and systems maintenance. Students learn about repair and construction principles behind both traditional and modern boat building. Vigor Shipyard: Vigor Shipyard in both Seattle and Portland, has partnered with Portland Community College and Seattle Community College, respectively. On their sites, they provide training opportunities in welding that support workforce development for Vigor and other area maritime companies.